Jobs In Etisalat Telecom Dubai. If you are interested in relocating to Dubai, or are already living there, and are looking for a career in the telecommunications industry, you are probably interested in find out more about jobs in Etisalat Telecom Dubai. This large telecom group is one of the country's biggest employers and offers a range of employment options both for those looking for an entry level role and those with extensive experience in the telecommunications sector. Etisalat Telecom is a leading global telecom group in emerging markets with a current market cap of more than 132 billion AED. The company's net revenues are 51.7 billion and its net profits are around 8.3 billion per year, making it one of the world's most profitable telecom groups. As it also has a high credit rating, it reflects the company's impressive long term performance. Etisalat Telecom has now been established for 4 decades and was the United Arab Emirates' first provider of telecommunications services. The Etisalat Group is also an international blue chip organisation, providing innovatives services and solutions to over 160 million subscribers across 17 countries in Asia, Africa and the Middle East. Etisalat Group have a mission to provide a high quality customer service experience and to deliver their shareholders an impressive return while ensuring their investment in their company's long term future and supporting the economic development within all of the markets in which they operate. Etisalat strives to foster innovation, delivering new technologies and deploying up to the minute ICT platforms and high speed fiber optics. The company provides affordable mobile internet access for millions of customers and have won numerous awards within the industry including the GSMA's Global Mobile Awards. These many and varied sectors mean that there are opportunities available for those who have a wide range of qualifications and diverse experience. Those who are seeking an entry level position will find that there are vacancies within certain areas of the company. Customer services and sales are two of the areas in which new starters with no previous experience may be able to find a suitable position as long as they have a good standard of education, a personable manner and a good ability to problem solve. There are also ample opportunities for those who have specialist skills and particular qualifications in certain fields. For example, those who have qa law degree and experience in legal practice may be able to secure a position within Etisalat's legal department, whereas those who have ICT certification and a good knowledge of programming languages may be suited to a position within Etisalat's information technology department. There are even suitable positions for those who have considerable experience and extensive qualifications within the organisation. The management team require skilled staff who have already had many years of experience within a relevant industry and who can demonstrate their ability to lead such a forward thinking and globally recognised company. The amount of necessary experience and the qualifications which are deemed to be necessary by the company will, of course, vary between positions, however in general the most basic requirement is the completion of high school education to a reasonable standard. 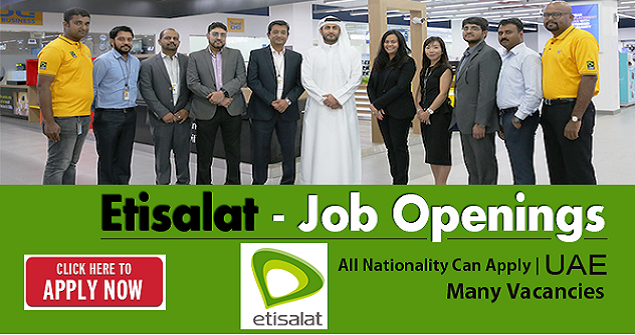 The first place that you should begin your search for jobs with Etisalat Telecom in Dubai is on the company's own website. In its Careers section, you will find current listings for all of the available vacancies and you can search either by country, keyword or by employment sector, making it easy to find suitable positions. Alternatively, vacancies are also listed on other Dubai job listing websites such as Gulftalent.com and Dubaijobs. Vacancies can be applied for online by submitting an up to date CV and submitting relevant personal contact details.